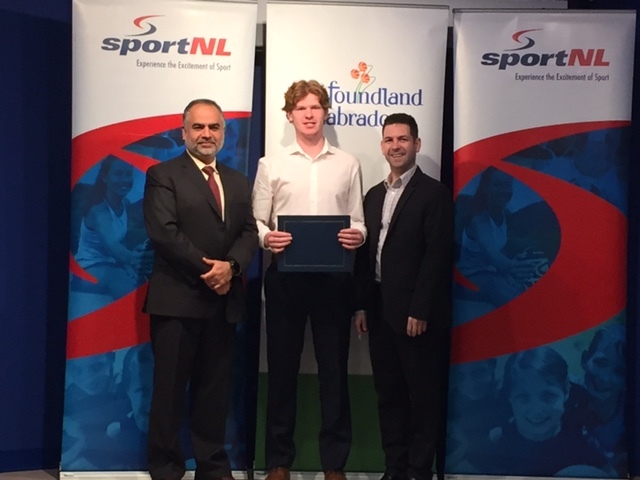 The 2018 Sport NL Scholarship Awards were presented today (Tuesday, May 22) at the Johnson Geo Centre in St. John’s. 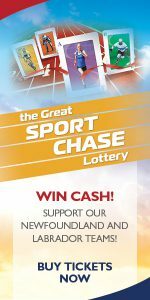 The Sport Newfoundland Labrador Scholarship Program provides financial assistance to qualifying amateur athletes, coaches and officials, who are enrolled in a post-secondary institution, to assist in off-setting the costs of training and competition. The program has been in place for over 25-years, with thousands of dollars being distributed to deserving students around the province. 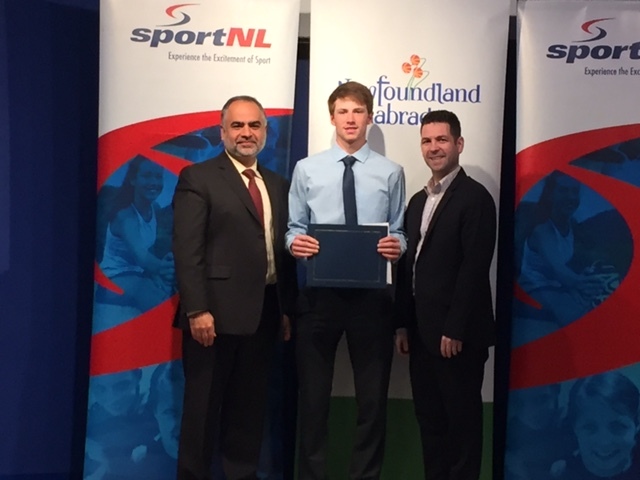 Sport NL also presents the Frank T. Butler Memorial Scholarship, valued at $1,500. Frank Butler was vital to the development of athletics at Memorial University, and played an integral part in developing inter-university sport experience across Canada. 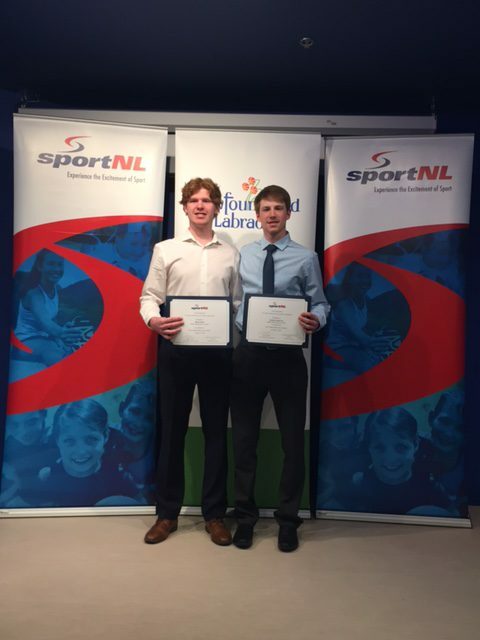 Softball NL would like to take this opportunity to Congratulate Jordan Pomeroy (Placentia) & Mark Stack (Petty Harbour-Maddox Cove) on being named 2018 Sport NL Scholarship Award Recipients. Jordan Pomeroy Is A First Year Kinesiology Student At Memorial University In St. John’s. His Performance At The U18 Men’s Nationals, The Canada Summer Games And The Senior Men’s Nationals In 2017 Earned Him A Spot On The Canadian Junior Men’s National Team That Is Competing At The 2018 WBSC Junior Men’s Softball World Championship in Prince Albert, SK From July 7-15. Named Athlete & Student of the Year – Laval High School. Recipient Of The Governor General Award, Claude Deschamps Memorial Award & Memorial University Entrance Scholarship. In 2018, Jordan Will Be Participating In The St. John’s Senior & Intermediate Men’s Fastpitch Leagues, Will Be Representing Canada At The WBSC Junior Men’s Softball World Championship In Prince Albert, SK (July 7-15) and representing Newfoundland Labrador At The U23 Men’s Canadian Fastpitch Championship In St. Leonard d’Aston, QC (July 31-August 5) And At The U19 Men’s Canadian Fastpitch Championship In Napanee, ON (August 14-19). Mark Stack Is A First Year Commerce (Co-Op) Student At Memorial University In St. John’s. He Played In The Senior & Intermediate Men’s Fastpitch Leagues & Provincials And Represented Newfoundland Labrador At The U18 Men’s Canadian Fastpitch Championships in O’Leary, PEI & The Canada Summer Games In Winnipeg, MB. Named To The Junior Men’s National Team 26-Man Roster, Attended The Junior Men’s National Team Regional Camp In St. John’s, NL, Attended The Junior Men’s National Team Evaluation Camp In Innerkip, ON & Attended The Junior Men’s National Team Selection Camp In O’Leary, PEI. 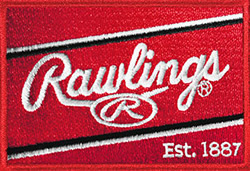 In 2018, Mark Will Be Participating In The St. John’s Senior & Intermediate Men’s Fastpitch Leagues, Will Be Representing Newfoundland Labrador At The U23 Men’s Canadian Fastpitch Championship In St. Leonard d’Aston, QC (July 31-August 5) And At The U19 Men’s Canadian Fastpitch Championship In Napanee, ON (August 14-19). Softball NL would also like to take this opportunity to Congratulate all of the other Sport NL Scholarship Award Recipients.